Other Comments: Commercial pilot-playing the FAA's CPAP game. So I'm coming up on my 5 year point with my present rig and I'm looking at new equipment. My goal would be to get two machines (of course insurance will only pay for one), a base unit that would stay at my home and a smaller travel unit. My main concern is that when I have used a travel unit in the past, it was from a different manufacturer so there was no data/compliance integration between the two. I'm looking for 2 machines that will share cloud data/Bluetooth data, specifically to integrate the data seamlessly. I have FAA reporting requirements that include annual, actual usage numbers, so having both sets of data working together saves A LOT of headaches (and the feds from holding my job hostage). My current research landed on the ResMed Air Mini for travel and the ResMed AirCurve 10 for home. Both seem to share data capabilities with AirView and I checked with my provider and they have access. Looking for pros & cons to this arrangement. Other suggestions for equipment pairs. Anyone have two machines on AirView that they alternate with? I currently use the PR REMstar Pro with FFM for both home and travel, but the thing is a brick (I don't use the humidifier on the road). I prefer to carry it in my main bag instead of carrying a 3rd bag. My previous travel unit was the HDM Z1 which crapped out a long while ago (another story for another time). I'm in the same situation with FAA reporting. I use the DreamStation Auto/DreamStation GO in the same way you're proposing! They work great......identical in performance. The GO is by far the easiest machine I have found for travel. It packs small and has no external power Brick. Both have data cards and integrate with Sleepyhead seamlessly. I have actually used the Sleepyhead report for FAA reporting on my last medical. I included the report and letter from my doctor indicating compliance and asked if in the future could I drop the doctor generated report. The regional AME indicated to my AME that he didn't have any issue with that. I'll find out next time around! Revolp, I would suggest you first look at a Resmed Airsense 10 Autoset as your primary machine. It is much more compact than the machine you currently use, and it comes in a very professional and tight travel case. This case will slip over the handle of your usual carry-on bag and I think you will find you can get double duty out of the Resmed. There is just no comparison to this machine, its size and portability compared to your current Remstar Pro. It is a quiet and very effective machine with full data. Resmed uses a cellualr signal to process data to MyAir. This data can be received by your DME who can file your required reports on your behalf with no effort on your part. The data is received by Resmed and available by serial number to your DME, who can prepare the reports. Try the Autoset and then decide if you still want a travel machine. All travel machines have the advantage of being small, but they are noisier, lack humidification and in the end not as comfortable as the Autoset. Camping is one thing, but I think you will find the modern full Resmed Autoset will meet all of your expectations for function, size and convenience, and will be as discreetly quiet. If not, get the AirMini or Philips Go. (05-30-2018, 02:35 PM)GuppyDRV Wrote: I'm in the same situation with FAA reporting. I use the DreamStation Auto/DreamStation GO in the same way you're proposing! They work great......identical in performance. The GO is by far the easiest machine I have found for travel. It packs small and has no external power Brick. Both have data cards and integrate with Sleepyhead seamlessly. I have actually used the Sleepyhead report for FAA reporting on my last medical. I included the report and letter from my doctor indicating compliance and asked if in the future could I drop the doctor generated report. The regional AME indicated to my AME that he didn't have any issue with that. I'll find out next time around! I appreciate the quick reply. I'll definitely look into that. I too use the Sleepyhead reports with the letter from the provider. For whatever reason the provider can never seem to 'get it right' when it comes to the data the feds want to see. They always equate FAA SI to DOT, which are VERY different. The GO sounds like a great rig. Not carrying around the brick sounds like a winner. We finally shed the Jepps just around the time this CPAP thing became an issue, so my bag weight didn't really change. Looking to lighten the load as much as possible as I hit the twilight of my career. (05-30-2018, 02:51 PM)Sleeprider Wrote: Revolp, I would suggest you first look at a Resmed Airsense 10 Autoset as your primary machine. It is much more compact than the machine you currently use, and it comes in a very professional and tight travel case. This case will slip over the handle of your usual carry-on bag and I think you will find you can get double duty out of the Resmed. There is just no comparison to this machine, its size and portability compared to your current Remstar Pro. It is a quiet and very effective machine with full data. Resmed uses a cellualr signal to process data to MyAir. This data can be received by your DME who can file your required reports on your behalf with no effort on your part. The data is received by Resmed and available by serial number to your DME, who can prepare the reports. Thanks for the tip! I guess I would have to check with my AME & provider to see if I can switch from CPAP to AutoPAP without the feds getting their hackles up, but the concept sounds good. Really trying to avoid carrying a 3rd bag, especially on deadheads, but if the unit is smaller than my current cinder block it will be better than what I do now. Under Medicare and ever insurance plan the Auto CPAP is the same billing code as a fixed CPAP. The difference is the squeeky wheel. You can ask your doctor to prescribe auto-titrating CPAP on the basis you are getting a new machine and you probably would benefit from auto-pressure. It makes a difference. Our health, location, and needs change. Auto CPAP keeps up and delivers the needed pressure accurately. 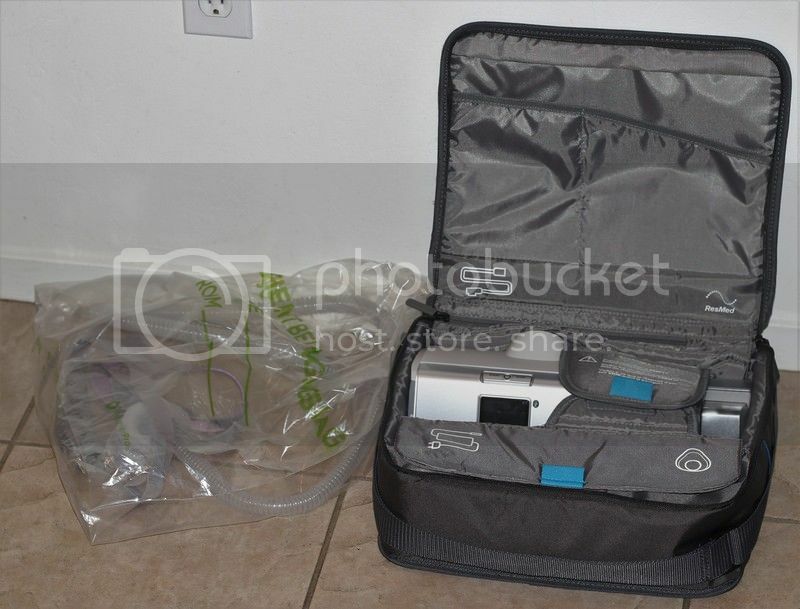 I have attached an image of my Resmed travel case as I normally use it in air travel. On the motorcycle, I just pack the CPAP, mask and hose in a small travel bag with other clothes. It is pretty compact. (05-30-2018, 03:22 PM)revolp1965 Wrote: I guess I would have to check with my AME & provider to see if I can switch from CPAP to AutoPAP without the feds getting their hackles up, but the concept sounds good. As Sleeprider said, the same HCPCS code is used for both fixed-pressure CPAP and auto-CPAP (APAP). It shouldn't even be necessary to bother your doctor about it, although a prescription that specifies auto-titrating CPAP is a good thing if you can easily swing it. The main production is negotiating with the DME, not the doctor, and that just requires being stubborn (although polite). If your Rx specifies a fixed pressure and you ask for a Resmed machine, the DME will probably try to give you an "Airsense 10 CPAP", which is a brick (no data), and if you object to that, the DME will probably grudgingly provide an Airsense 10 Elite, which has full data but no APAP. One further round of stubbornness on your part is necessary at that point, and the DME will even more grudgingly haul out an Airsense 10 Autoset. That's how it worked in my case recently: my Rx says fixed pressure, but the insurance code is E0601, which also covers APAP. The argument I used is simply that I'll have the machine for five years and there could be all kinds of changes to my therapy in that time, which means that having only a fixed-pressure machine is too restrictive. I want to be prepared for more than a simple pressure change from x to y in future prescriptions. With my fairly reasonable and not completely money-grubbing DME, that argument did happen to work. YMMV. There's nothing forcing you to use APAP mode; all APAP machines can be set to fixed-pressure mode as well. The Airsense 10 Autoset is the gold standard for quality, quietness, reasonable algorithms, and a bunch of other stuff. It slices, it dices, etc. I highly recommend it also. For a while I was casually shopping for a travel (mini) machine, but I gave that up indefinitely when I found that they all have serious problems: if it's not noise through the tube & mask, then it's flakiness of one kind or another, as you know from your experience with the Z1. (And BTW, if you would, please do post that saga some time, either in one of the existing Z1 threads or in a separate thread. Thanks.) At this point, if I were traveling in tourist fashion (that is, by motor vehicle and/or plane, rather than backpacking and carrying a battery for the machine), I would bring the small & lightweight A10 Autoset in its carrying case, possibly after replacing the humidifier tank (which is pretty small to begin with) with Resmed's custom side plate for the A10 that takes the place of the humidifier. The side plate is not included with the standard package, is a separate item, but is only about $15. The large power-supply brick is a slight pain, yes, but that doesn't seem major. And I would travel with a standard hose rather than the heated one. There are big advantages to having two of the same or very similar machine: you automatically have a backup of the power supply, the humidifier tank, the heated hose, etc. And you don't need to buy two different kinds of supplies, like filters. I suggest, before buying a Dreamstation Go or an Airmini, reading all the reviews of it that you can find. I'm not impressed by any of the four existing travel/mini machines ... at least, not enough to buy one until some of the big problems have been fixed in future generations of the hardware and firmware. Right on.....we just switched to the IPad from a Microsoft product and man what a difference in weight/performance. Without the power brick and the new tablet it has really made a difference. I never use humidity so the lack there of has not effected me as for noise I actually find the GO to be quieter.